How extending the life of our ‘stuff ‘ can be a virtuous pursuit. 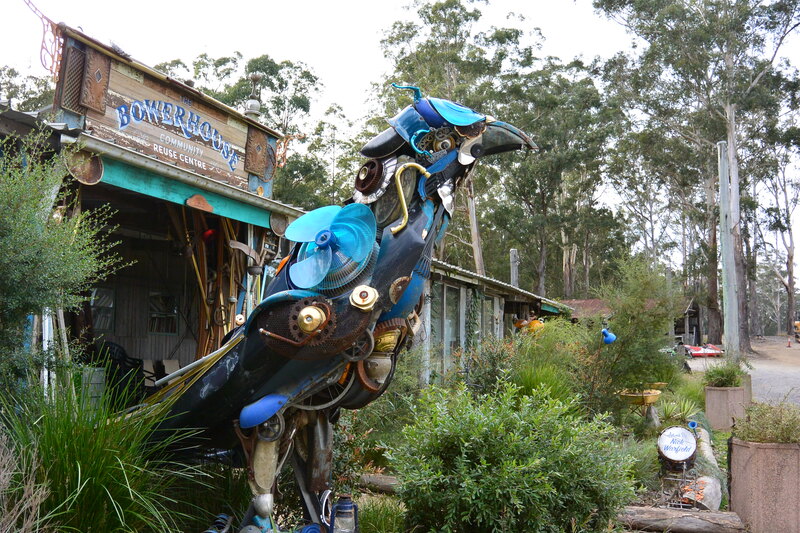 At the entrance of the Bowerhouse Community Recycling Centre stands a bower bird. Its body is made of once useful objects: scrap metal, cogs, worn tyres. Here, ‘junk’ is given new life, takes on a new texture. The bower bird’s feet are the curled prongs of rusty garden forks. The head of a plastic rake fans out over its breast. When the Bowerhouse first opened its doors almost thirty years ago, it’s purpose was to recycle building materials that were needlessly ending up in landfill. Since then it’s broadened its focus to the reusability of all products, becoming something of a hub for thrifting, fixing and up cycling. There’s workshops spread throughout the year, but from Monday to Friday the waste-less action centres around the Bowerhouse op-shop. It’s filled, as you might expect, with community donations; home wares, clothes, furniture. But as the wall of welded bicycles frames indicates, this is no ordinary thrift shop. It’s been built, or rather up cycled around a certain vision, a way of seeing that appreciates the worth in what could otherwise be treated as waste. Being at the Bowerhouse reminds you that our fixation with new is itself, actually quite new. Our grandparents were proud menders and fixers; to someone of their generation, extending the life of stuff was simply common sense. Slowly, the ‘waste not, want not’ ethos is creeping back into our lives again. We’re beginning to recognise the virtue of buying things that last; or of fixing or up cycling what we already have. While saving money, it also helps us tread more lightly on the earth. Essentially, it’s a sustainable version of a two-for-one deal; each time we choose not to buy new, we’re both reducing waste and conserving natural resources. Besides, who needs new when we’ve got scones and marmalade and the wisdom of our thrifty elders? If waste is merely a failure of imagination, who’s to say that we can’t all be bower birds? Proud salvagers; noble guardians of the earth’s precious resources. When we recognise the life that goes into our stuff, we can better appreciate the life that’s in it still. It all starts with small, everyday acts of care. And maybe a trip to the Bowerhouse.